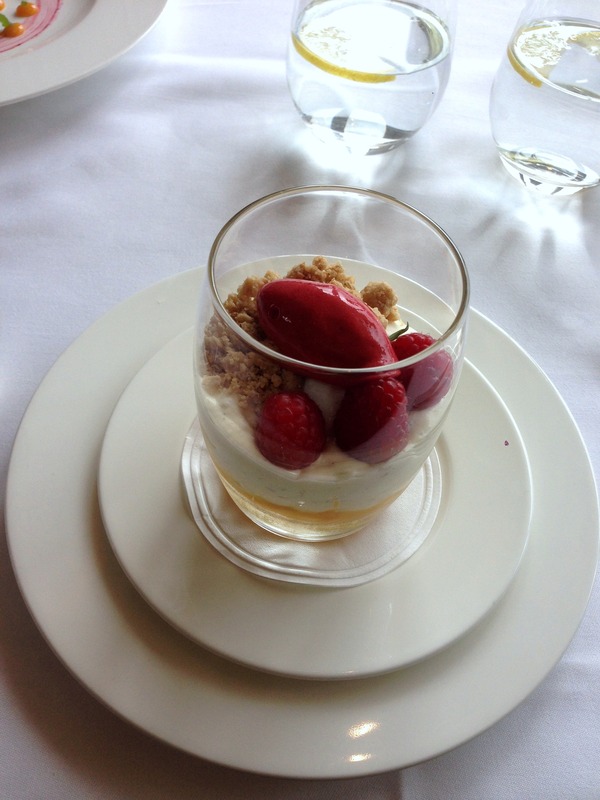 We recently tried the set lunch menu at Galvin at Windows, a Michelin One Star Restaurant by the renowned chefs and restaurateurs, the Galvin Brothers. Located on the 28th floor of the Hilton Hotel on Park Lane, Galvin at Windows offers glorious views over Hyde Park and Central London. The three-course set lunch with bellini is priced at £33 and was great value, offering three choices for starter and main, and two choices for dessert. 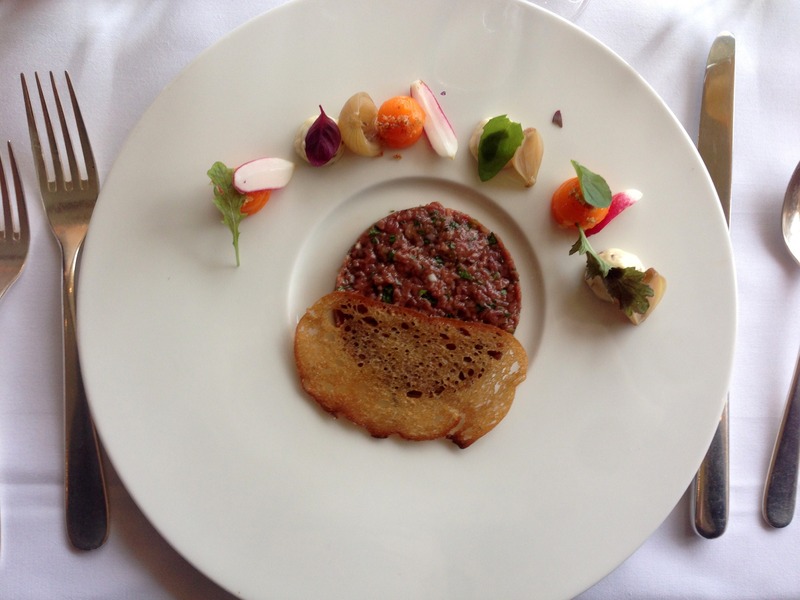 We both started with the beef steak tartare which was lovely. The beef was tasty and had been finely chopped and marinated with herbs and a strong level of acidity for a great flavour. Accompanying the tartare was a well-made selection of condiments including mustard mayonnaise, a gorgeous confit egg yolk and pickled vegetables. 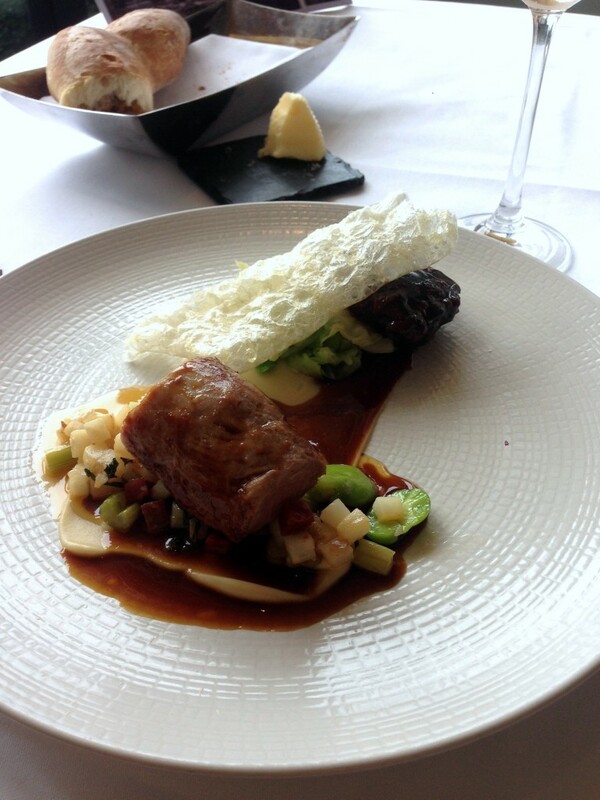 To mains, and the roasted fillet of Suffolk pork with braised pork cheek proved to be an accomplished dish. The pork cheek was particularly delicious as it was tender and rich with flavour, although the fillet was a touch chewy as it was slightly overcooked. All the other elements on the plate were good, including a fricassée of broad beans, celeriac and a chorizo and honey spiced jus, all of which were delicious and worked well in bringing the dish together. Kimchee risotto with slow cooked egg, fresh corn, sesame and Parmesan proved to be a very interesting dish. 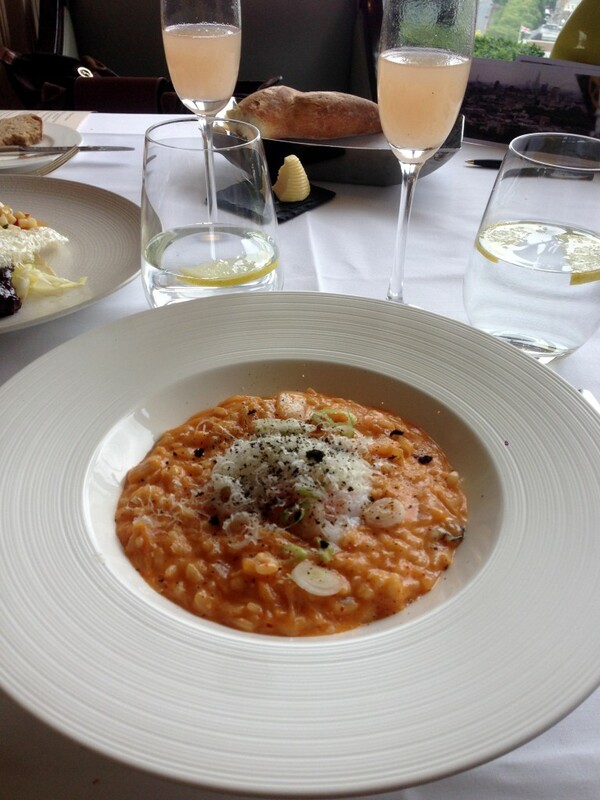 There was good depth in the stock, the rice was al dente and the egg added a lovely richness to the risotto. The big disappointment however was that it was very salty. To desserts, and an apricot and cherry almond tart with a verbena cream was good but not great. There wasn’t enough of a frangipane flavour in the tart, and it lacked for a buttery sweet pastry that makes classic French tarts taste so great. A second dessert of rice pudding with peach compote, raspberries and pink pepper sorbet was tasty and enjoyable as it was fresh and very summery. There were a few elements in the Galvin at Windows lunch menu that could have been better, but on the whole, I couldn’t fault the cooking which was accomplished and refined. Another plus point was that the menu was very reasonably priced at £33, making it decent value for money. Other plus points included great service and wonderful views. The lunch menu Galvin at Windows definitely gets a big tick from me. 1. The quality of the cooking especially at this reasonable price point. 1. The saltiness in the kimchee risotto. Lunch menu price: £33 for three courses plus a bellini. Excludes other drinks and service. Last week I attended a preview evening of the ‘Around the World in 80 Tastes’ experience (£100 per person) at the gorgeous St James Court, A Taj Hotel on Buckingham Palace Gate. The experience takes you through a culinary journey of four of the different restaurants in the hotel with tasting plates paired with matching wines. We began our evening with a Laurent Perrier Champagne flight paired with canapés in the St James Courtyard of the hotel, an idyllic outdoor dining space surrounded by the world’s largest Shakespearean frieze. It’s a gorgeous al fresco spot, little known about. So spread the world as it’s a lovely spot for a drink and deserves greater recognition. 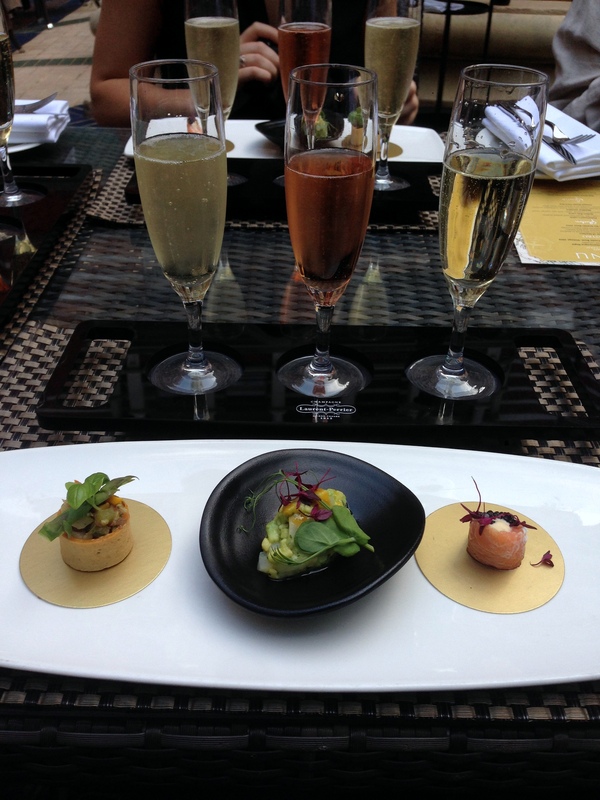 For our champagne flight we had (from right to left) the Laurent-Perrier Brut, Cuvée Rosé and the Vintage 2004 with scallops and avocado, smoked salmon and ratatouille. The champagnes were delectable and the canapés were fairly tasty. Next we moved to Bistro 51 where a contemporary European menu is served. I recently dined at Bistro 51 where I had a mixed experience. You can read about that meal here. 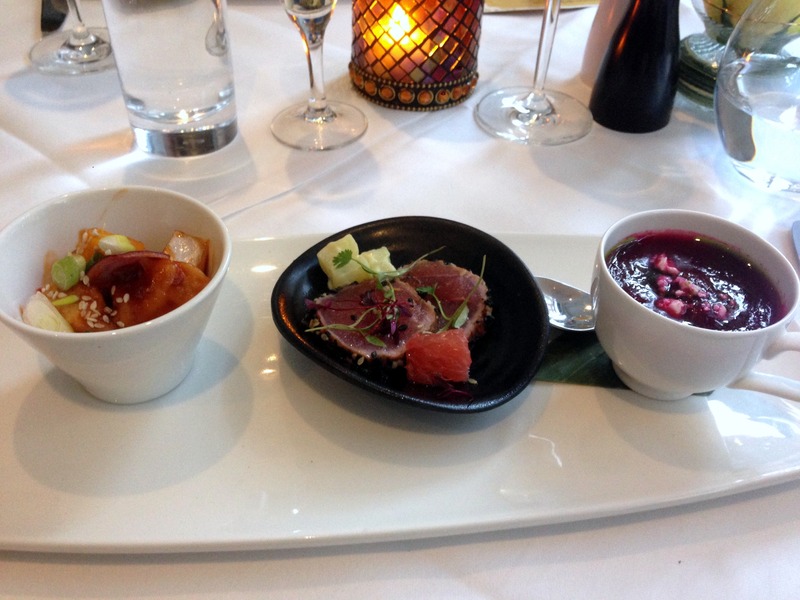 As part of this ‘Around the World in 80 Tastes’ culinary journey, we had a trio of starters including stir-fried chicken with bell peppers, sesame-crusted tuna with pink grapefruit and beetroot gazpacho with feta crumble. The tuna was smart and very tasty, and nicely flavoured with some soy sauce and sesame seeds. The gazpacho was good but could have done with a little more feta for a better balance between sweet and savoury. The chicken didn’t work and wasn’t that appetising. To accompany the starters was an Argentinian Septima Malbec. 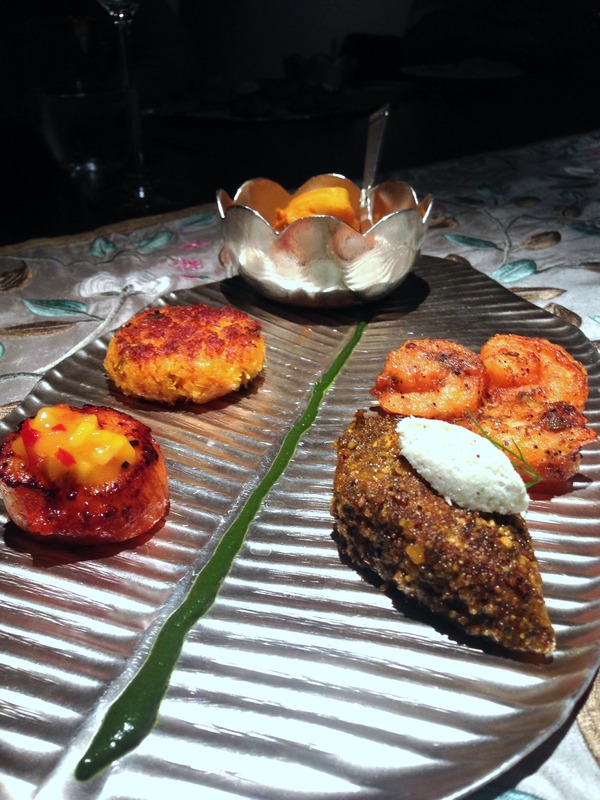 Next we moved to Quilon, an Indian One Michelin Star Restaurant which was the highlight of the evening. Here we enjoyed some pepper shrimp, crab cake, lentil fish, grilled scallop and the Quilon signature fish curry of halibut simmered in coconut, chilli and raw mango sauce. All of these were delicious and perfectly prepared. My particular favourites were the lentil fish as it was beautifully moist and succulent and the fish curry as its flavour was delightful. The tasting plate was accompanied by some Malabar paratha which was outstanding for it was wonderfully light and flaky. The accompanying wine was a Chapel Down Flint Dry. From Quilon we moved to Kona, a newly opened restaurant at The St James Court Hotel that serves contemporary dishes prepared using locally sourced, sustainable and organic ingredients. It’s a beautiful, modern looking restaurant, and here we tried the Sussex lamb cooked two ways, as a cannon and Bolognese. 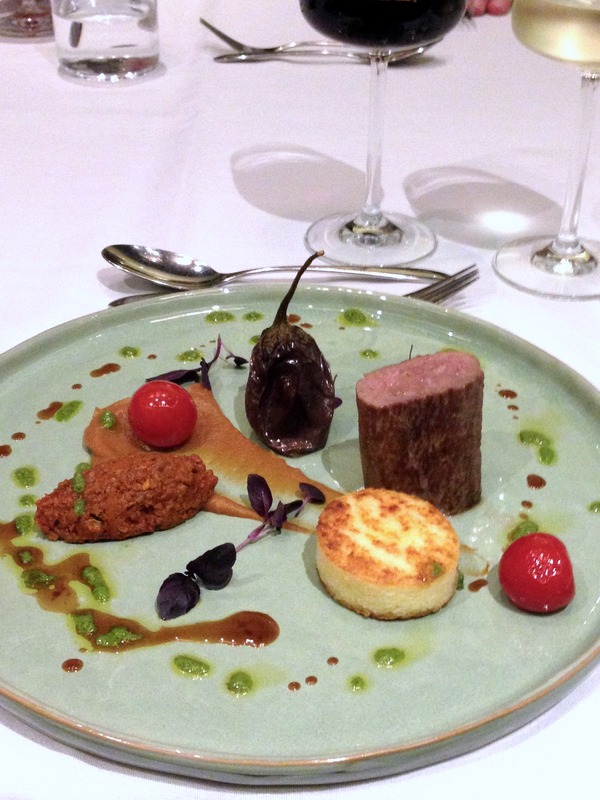 The lamb was served with aubergine caviar, polenta, wild roquette pesto and confit eggplant. This was respectable, tasty cooking, although I would have preferred the cannon to more medium rare. The accompanying wines included an Albarino Davila. To finish, we had a dessert platter of calvados marinated apple on a walnut and pecan crumble, chocolate ganache and a deconstructed lemon meringue pie and poppy streusel, all of which were nicely done. “Around the World in 80 Tastes’ was great fun as it offered lots of different flavour sensations, and I can see this as a good date night option if you want to impress someone with a taste of something a little different. Without doubt, the highlight was the food at Michelin starred Quilon. The food at the other outlets held up well too, and overall £100 was a reasonable price to pay when you take into account the champagnes and the pairing wines. When Dabbous opened in 2012, it became THE most talked about restaurant in London. The cutting-edge Modern European cooking by Oliver Dabbous, previously of Le Manoir aux Quat’Saisons, Hibiscus, Mugaritz, The Fat Duck, Noma and Texture, bewitched the critics. Dabbous went on to earn critical acclaim, a Michelin Star in 2013, and the distinction of being the most unattainable dinner reservation in town. The décor at Dabbous is every bit as cutting edge with the restaurant carving out a dark, minimalist space. Dabbous oozes industrial chic with the sound of loud house music ringing in the background. In the basement is Oskar’s Bar, named after Ollie’s business partner and Dabbous co-founder Oskar Kinberg who was once the head barman at The Cuckoo Club, a private members’ club. Here bar snacks and a heady array of cocktail delights is served, making Oskar’s Bar a go-to destination for cocktail lovers. Together the pair also opened Barnyard in 2014. 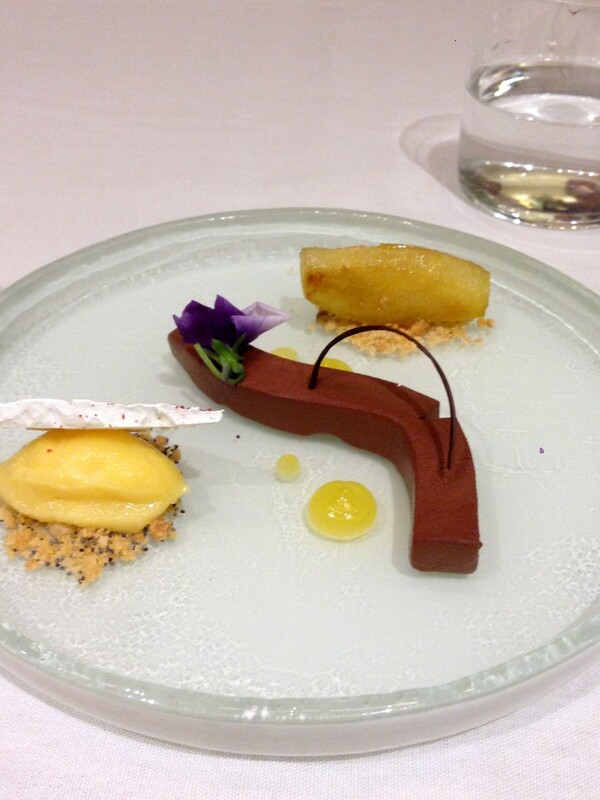 Dabbous offers a four-course set menu (£56) as well as a seven-course tasting menu (£68). 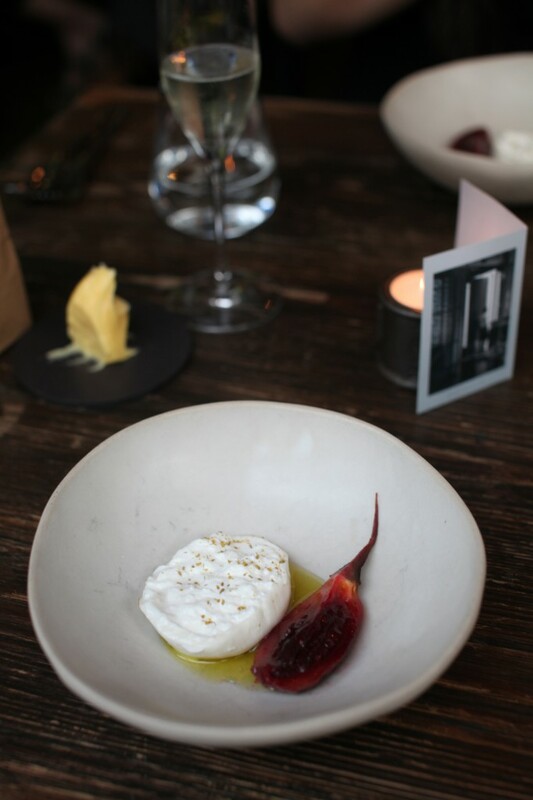 We chose the latter option, which began with a dish of burrata, basil and tamarillo which was lovely. The burrata was creamy and the basil was fragrant. But it was the deliciously zingy tamarillo that proved to be the most exciting element of this dish. It’s lively flavour and freshness brought all the elements of the dish together beautifully. Simon Rogan launched Fera at Claridge’s in May 2014, taking over from the space that was once occupied by Gordon Ramsay at Claridge’s. The word Fera means ‘wild’ in Latin and was chosen as the name for Simon’s London restaurant to reflect both the influence of nature and seasonality that are key to Simon’s cooking. Nowhere is this more evident than at Simon’s 12-acre farm where he grows his own fruit and vegetables, and breeds poultry, sheep and cattle. Simon’s love of harvesting the finest produce combined with his exacting standards has earned him the distinction of being one of the best chefs in the UK. Today Simon holds two Michelin stars at his flagship restaurant L’Enclume in Cartmel, as well as a one Michelin star at Fera. Fera was also recognised as Newcomer of the Year by in both Harden’s London Restaurants 2015 Guide and Decanter Magazine. 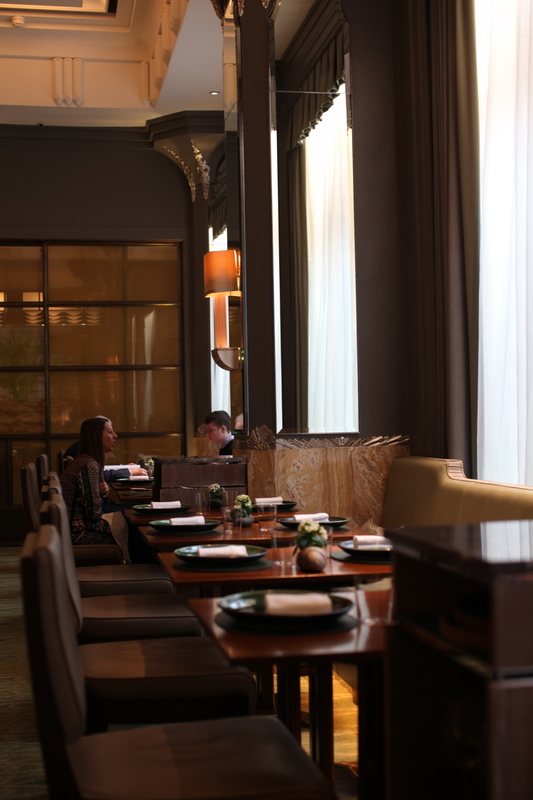 The art deco design of the restaurant blends beautifully with the grandeur of Claridge’s. But there are also softer, natural touches such as walnut tables and a ‘tree’ in the centre of the room to complement the opulence of the dining room. Along one wall is an open entrance to the kitchen, which offers views of the pass. There is also an intimate bar area in one corner of the restaurant that accommodates five guests. We went for the tasting menu and this was truly an experience to behold. The menu consisted of a canapé, three amuse bouches and eight courses for a very reasonable £95 (Wine to accompany 6 courses – £85.00). 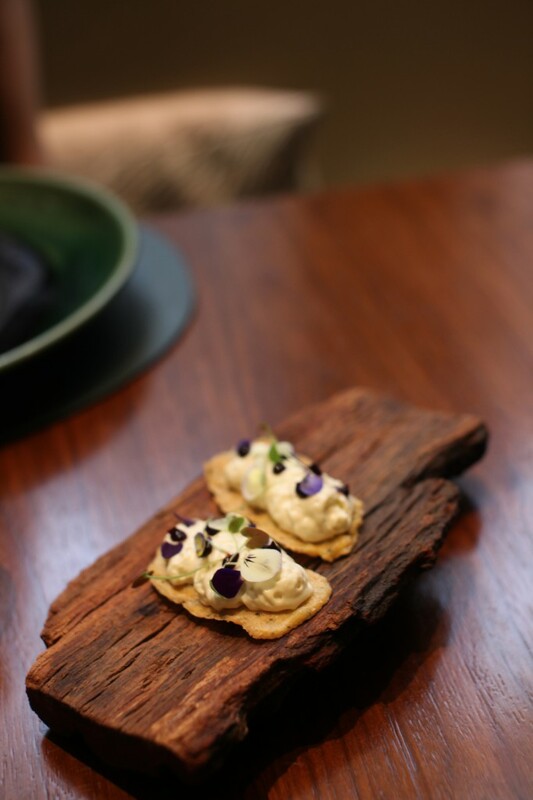 The canapé was a blue cheese emulsion on a chickpea and rosemary wafer. This was spectacular, with the emulsion boasting of a delicate cheesy flavour and a lovely airy lightness. The wafer was crispy and thin, and to finish was a drizzling of a tangy, sweet vinegar and elderberry gel that brought everything together beautifully. 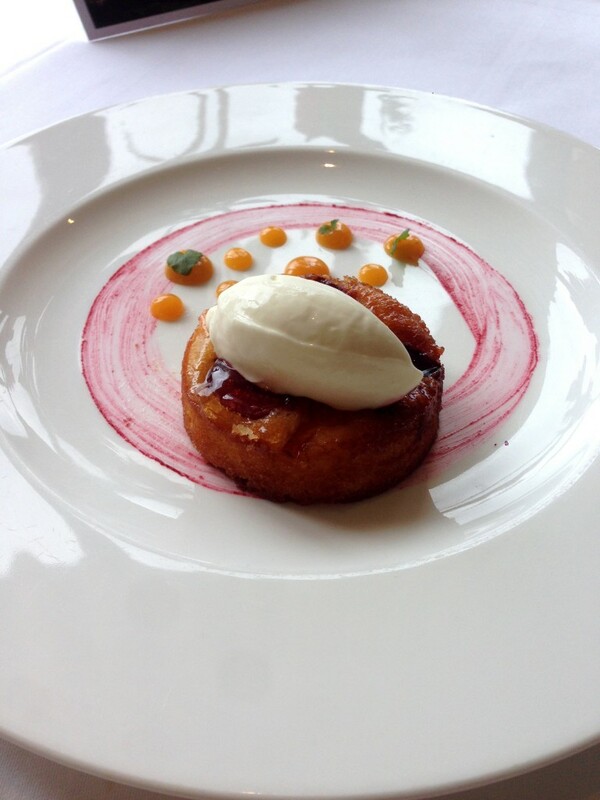 Arbutus is a one Michelin starred restaurant which offers a modern European bistro menu. Located in the heart of Soho on Frith Street, Arbutus is the brainchild of Anthony Demetre and Will Smith. The pair met while working together at Putney Bridge when Demetre was Head Chef and Smith was the restaurant manager. Demetre previously trained under the guidance of Marco Pierre White and Pierre Koffman and within a year of becoming head chef at Putney Bridge in 1999 he had earned the restaurant a Michelin star. The pair decided to venture solo and thus Arbutus was born in 2006. In 2007 Arbutus went on to win a Michelin star and Four AA Rosettes. Two other restaurants from the pair followed with Wild Honey in Mayfair which also holds a Michelin star, and Les Deux Salons in Covent Garden which offers an all day bar and grill menu. I first visited Arbutus soon after it first won its star and was thrilled with the energy of the food as it was vibrant, fresh and accomplished, yet not too pretentious. The menu was also well priced and ever changing based on what was seasonal. I also liked the intimacy of the dining room which was simply furnished yet inviting. Little has changed in terms of the look of the restaurant and it continues to be intimate and inviting. The menu still offers up some interesting choices although prices are of course higher than way back when. 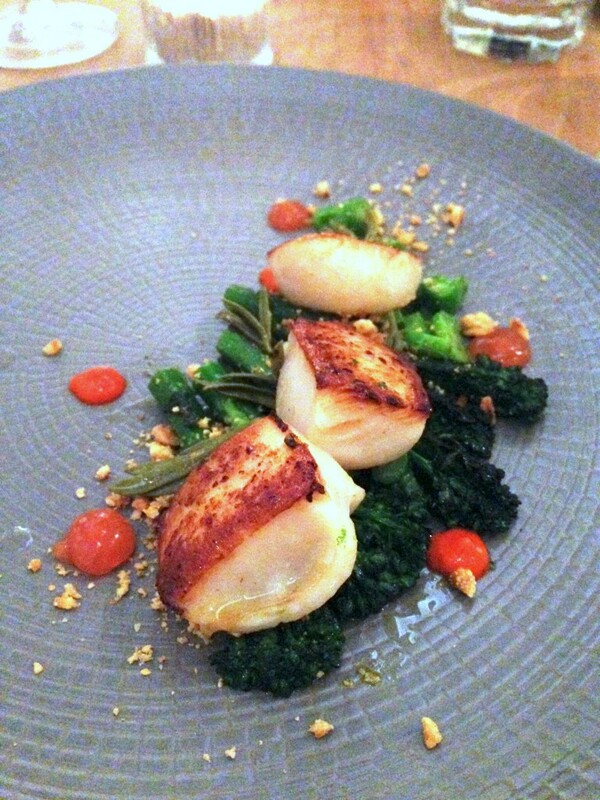 During our visit to Arbutus a couple of weeks ago we started with some Scottish scallops (£16) which were plump and beautifully cooked. There was some piquillo pepper which offered a lovely sweet contrast to the scallops. Some nicely toasted hazelnuts added a very enjoyable nuttiness and crunchiness, and pickled sea herbs provided a sense of freshness. L’Atelier de Joël Robuchon is a name that needs little introduction with the spectacular French dishes created by masterchef Joël Robuchon winning hearts the world over. Joël Robuchon is the most Michelin starred chef of all time and holds no less than 25 Michelin stars across his nine restaurants around the world. The London L’Atelier, a one Michelin star restaurant, can be found on West Street in the West End and upholds the sleek black and red look that is the hallmark of an L’Atelier restaurant. There are several levels to the restaurant. On the ground floor is a stunning Japanese-inspired counter with bar seating where diners can watch the chefs go about creating their works of art in the open kitchen. On the first floor is the restaurant area that hosts a more traditional seating arrangement with well-spaced tables, and on the second floor is the bar and terrace that serves an impressive array of cocktails and spirits. The head Chef is Xavier Boyer who has worked with Joël Robuchon for 13 years and previously led the kitchens at the L’Ateliers in both New York and Taipei. Xavier was involved in the 2006 launch of the London L’Atelier, so this is a home coming of sorts for him. I recently got to try Boyer’s cooking when he was the chef-in-residence during the 10 days of the London in the Sky pop-up and his food was absolutely delicious. 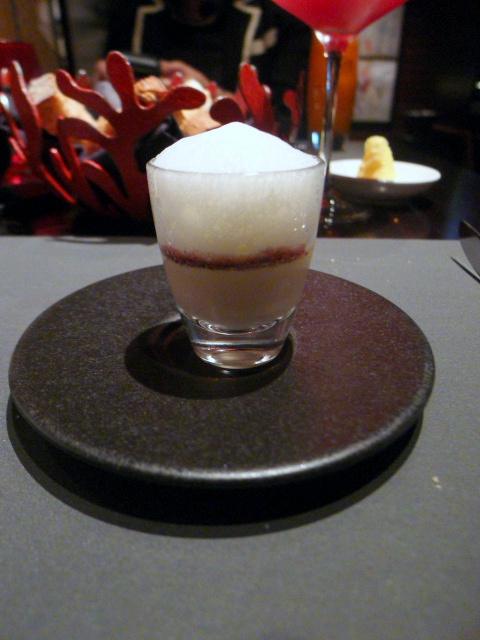 The amuse bouche was a royale of foie gras with white truffle, port reduction and a parmesan foam. This was a gorgeous combination, with the unctuous rich flavour of foie gras pairing beautifully with the deep sweetness of the port. The use of nutty overtones of the parmesan was also a lovely contrast to the foie gras as well. Eleven Madison Park – so named as it is located on Eleven Madison Avenue facing Madison Square Park – is a three star Michelin restaurant, a designated Grand Chef Relais & Châteaux restaurant and the fourth ranked restaurant on San Pellegrino’s World’s 50 Best Restaurants list. Housed in the classical looking Credit Suisse building, the spacious dining room speaks of grandeur with its huge floor-to-ceiling windows and impressive art deco design. Eleven Madison Park is the brainchild of Executive Chef Daniel Humm, a Swiss-born chef who earned his first Michelin star with Gasthaus zum Gupf, a restaurant located in the Swiss Alps. Humm also cooked at the famed Restaurant Pont de Brent, a Michelin starred restaurant in Montreux before moving Stateside to San Francisco in 2003. His rise in the States was meteoric. In 2004, the San Francisco Chronicle named him a 2004 Rising Star Chef, and in 2005 Food & Wine named him one of Best New Chefs of 2005. Humm took over the reigns as executive chef of Eleven Madison Park in 2006, and under his guidance Eleven Madison Park received a four star rating from The New York Times in 2009. 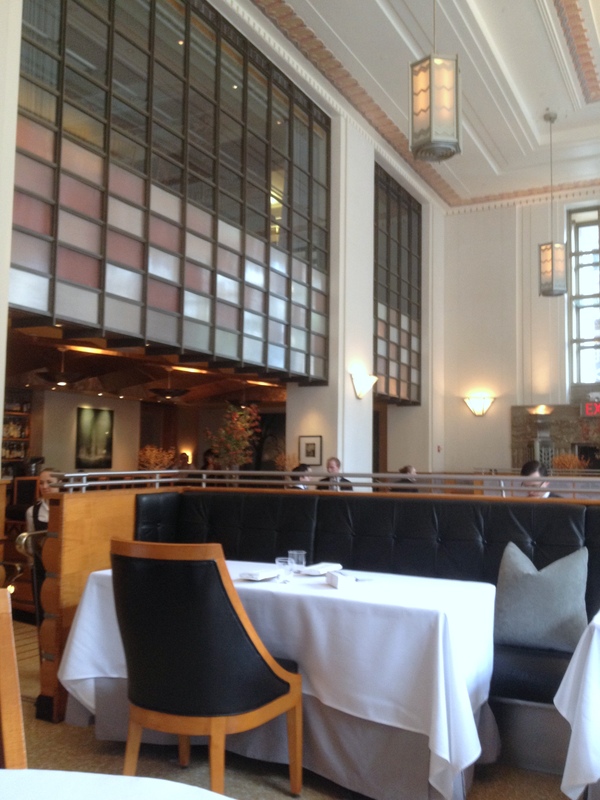 In 2010, Humm was awarded the James Beard Award for “Best Chef, New York City.” And of course, Eleven Madison Park holds three Michelin stars and a ranking as one of the best restaurants in the world. There are two branches of A Voce Restaurant in New York. The original is on Madison Avenue, which following on from its success and a Michelin star resulted in the second one at Columbus Circle. This too has received critical recognition as well, with A Voce Columbus also garnering a Michelin Star for its fine Italian cooking. A Voce Columbus occupies a fabulous space on the third floor of the Time Warner Center which was formerly Gray Kunz’s renowed Café Gray. It’s smart and sleek with a long elevated bar area that serves knockout cocktails and bar food. The bar area offers some great people watching, but the best aspect at the restaurant are from the tables that line the windows from where you can peer out onto the goings-on at Columbus Circle and the fringes of Central Park while you feast. 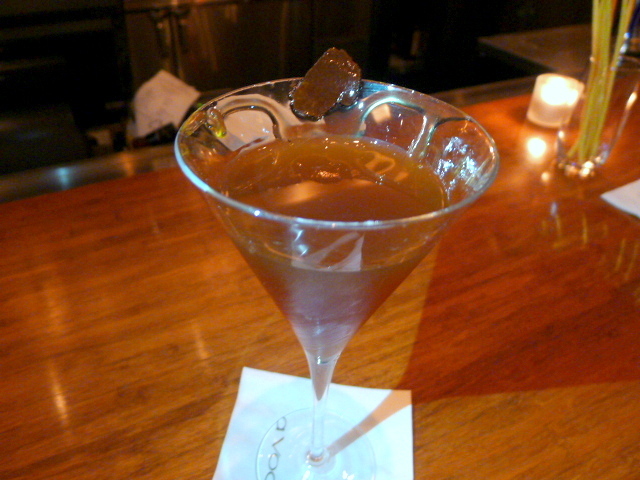 I mentioned the knockout cocktails and for our aperitif we tried the excellent Il Tarfuto cocktail ($33), Michter’s Rye Bourbon mixed with a truffle infused vermouth and topped with a drizzling of white truffle honey and a sliver of bourbon pickled black truffle. The mix takes 2 to 3 weeks to make and was a heady concoction of truffle aroma and flavour. The honey did a great job of sweetening things up, and this made for a delicious way to start the meal.